Nigel Pearson stuck with the same side that humbled United, but they came up against a very well drilled Warnock defence that meant that chances were few and far between. 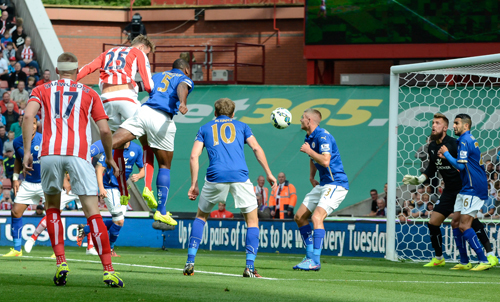 The first real chance of the game came in the 13th minute, when an Ulloa header set Vardy up. His first touch took the keeper out of the equation but three defenders raced to block the City striker’s shot. The rebound fell to Nugent but his attempted curler beat the far post. In a very tight encounter both sides were reduced to long-range efforts Jedinak and, at the other end, Nugent both failing to trouble the keepers. It was Palace who began to apply some pressure towards the break, the nearest they got to an opener was when Cambiasso had to block a Jedinak effort on the line. Schmeichel then had his palms stung by a vicious Puncheon 30 yarder. Cambiasso set Vardy up with a chance just before half-time, but he missed the target and 0-0 was a fair enough scoreline at the break. Although City had the first chance in the second half, Nugent having a shot blocked by Ward, the game soon swung dramatically in favour of the Eagles. In the 51st minute. Dann rose above the City defence to nod on a corner, and summer-target Campbell touched it past Schmeichel from close in. Three minutes later another ball was delivered from the left after Morgan fouled Bolasie. 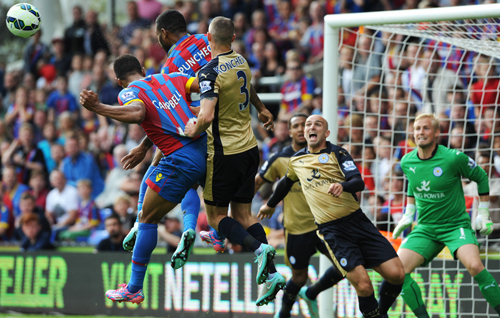 Jedinak met Puncheon’s free-kick, heading across Schmeichel and in at the far post. For a City side that looked out of sorts, with passes going astray and a long ball tactic that was gobbled up by the giants in Palace’s defence, the game already looked out of their reach. With half an hour remaining, Simpson replaced De Laet and Mahrez came on for Cambiasso, but still City struggled to make any impression on the red and blue wall. James also came on for Hammond but City were being kept easily at bay. 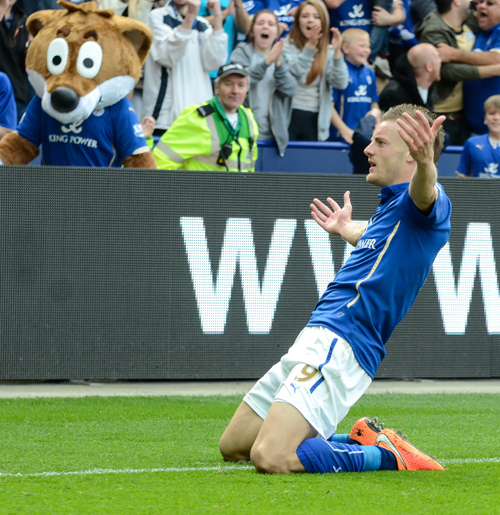 When Vardy didn’t get a penalty after being shoved in the back by Ward we knew that the game was up. Simpson had a good effort blocked, but City were never able to create any real pressure late on and succumbed to their second defeat of the season. Gary Lineker summed it up with his: “After the Lord Mayor’s Show” comment on Match of the Day. We knew there would be days like these, and to suffer one and still be in the top half means that we aren’t doing too bad. Palace: Speroni, Ward, Dann, Bolasie (Guedioura 90), Campbell (Chamakh 73), Jedinak, McArthur, Delaney, Ledley, Kelly, Puncheon. Subs Not Used: Mariappa, Doyle, Zaha, Hennessey, Gayle. Leicester: Schmeichel, De Laet (Simpson 64), Morgan, Moore, Konchesky, Hammond (Jamies 71), Cambiasso (Mahrez 64), Drinkwater, Nugent, Vardy, Ulloa. Subs Not Used: Hamer, King, Wasilewski, Schlupp. Referee: Keith Stroud. Attendance: 24,311. The FOX will be following the fortunes of Leicester City in 2014-15, as we have since the 1986-87 season, so if you want each copy posted to your door then take out a subscription now. You will have the option to buy our Champions cigarette card set (which will be posted out with the Summer Special NOW) at a greatly reduced price of £3.50. To subscribe either print out the subs form at the bottom and post it to us, or click on the ‘with or without cards’ options below to pay online via Paypal. Nigel Pearson made four changes to the line-up that won at Stoke, with Schmeichel, Cambiasso, Drinkwater and Vardy replacing Hamer, Mahrez, King and Schlupp. City had plenty of firepower with Ulloa, Vardy and Nugent in the side and clearly planned to go on the offensive but after a bright opening spell they suffered a setback in the 13th minute. A slick United move had already seen Di Maria thread Van Persie through on goal, but Schmeichel saved the Dutchman’s effort; but he couldn’t deny him two minutes later. Falcao beat De Laet down the left and delivered a far post cross for Van Persie to nod home. Three minutes later it looked as though the afternoon might turn sour when United went further ahead. 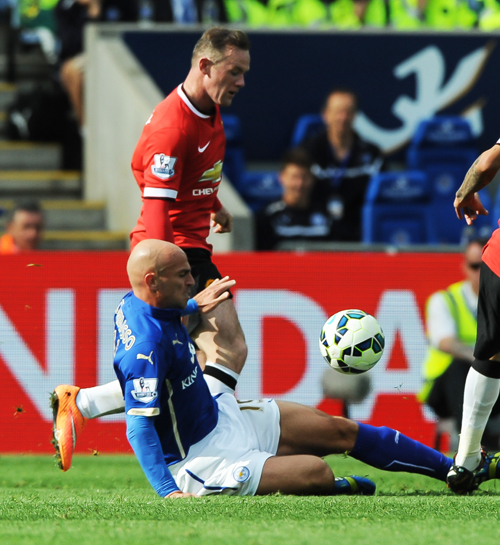 Di Maria exchanged passes with Rooney before producing a sublime chipped finish over Schmeichel and into the net. But City weren’t cowed and struck back soon afterwards, the sheer persistence of Vardy seeing him cross from the goal-line on the right. 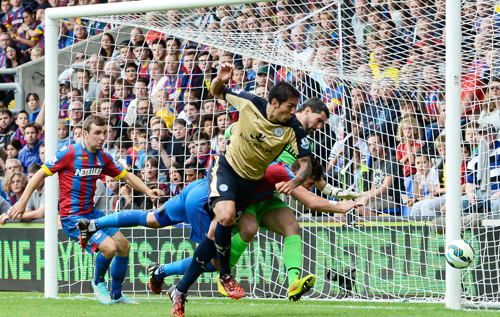 Ulloa was waiting at the far post to plant a header past De Gea to put his side back in the game. Blind forced a save from Schmeichel and Di Maria screwed an effort wide when well-placed, but City made it to the half way point just a goal behind and with plenty of hope. 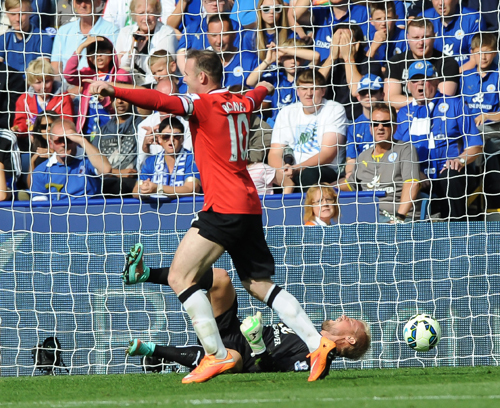 However, it was all United after the break, Falcao rattling the crossbar after being set up by Rooney. The visitors then restored their two-goal lead in the 57th minute when Herrera applied a deft touch to a Di Maria shot to leave Schmeichel stranded. City now had a huge task ahead of them to get anything from the game, but they did that, and more. 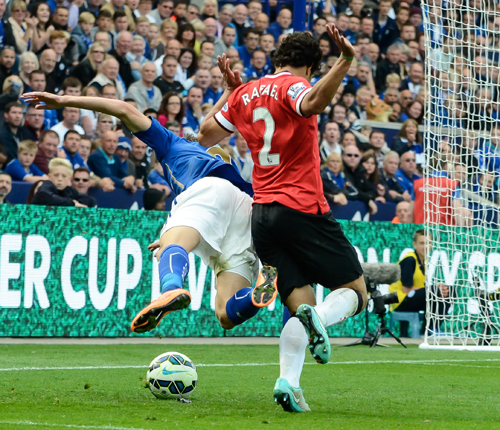 Vardy raced down the left and put in a robust challenge on Rafael, robbing him of possession. Rafael then nudged him in the back in the area and referee Clattenburg pointed to the spot. Nugent made no mistake from 12 yards for his first goal of the season. Two minutes later the KPS was (literally, in parts) rocking as Cambiasso slotted in the equaliser after seizing on a loose ball from a blocked Hammond shot. It was all City now and De Laet set up King, on for Cambiasso, for a shot that flew narrowly wide. In the 79th minute De Laet robbed Mata on the halfway line and played a perfect ball for Vardy, who raced in on goal before giving De Gea no chance with a smart finish for a goal that his incredible performance had deserved. Vardy still wasn’t finished and beat Blackett down the right before a clumsy challenge in the area from the United defender earned him a red card. With Nugent off the field, Ulloa stepped up and did just as good a job from the spot to put the game beyond a bewildered looking United. After more manic celebrations many City fans were taking photos of the big screens, unable to believe the 5-3 scoreline. Leicester: Schmeichel, De Laet, Morgan, Moore, Konchesky, Drinkwater, Hammond, Cambiasso (King 71), Vardy (Schlupp 85), Nugent (James 75), Ulloa. Subs Not Used: Hamer, Mahrez, Wasilewski, Wood. Manchester United: De Gea, Rafael, Rojo, Blackett, Evans (Smalling 30), Blind, Herrera, Di Maria (Mata 76), Van Persie, Rooney, Falcao (Januzaj 71). Subs Not Used: Lindegaard, Shaw, Valencia, Fletcher. Referee: Mark Clattenburg. Attendance: 31,784. 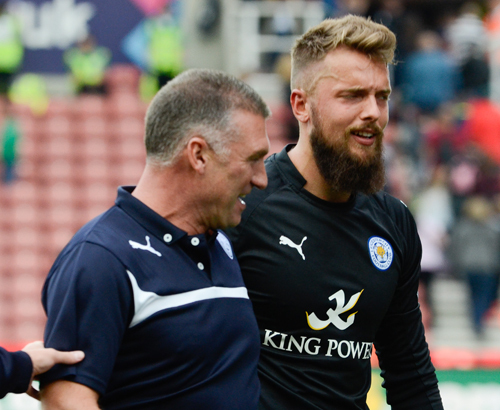 City’s first win of the season arrived on Saturday thanks to a second half Ulloa goal at the Britannia Stadium against Stoke…Nigel Pearson made one change to the side that drew with Arsenal, and that was enforced, with Schmiechel picking up a knee injury while playing for Denmark, Ben Hamer made his League debut. Stoke had the better of the opening spell and Nzonzi made impressive progress down the middle before sending his shot wide. In the 17th minute Crouch should have done better with a glancing header from a Moses corner that missed the target from 10 yards. 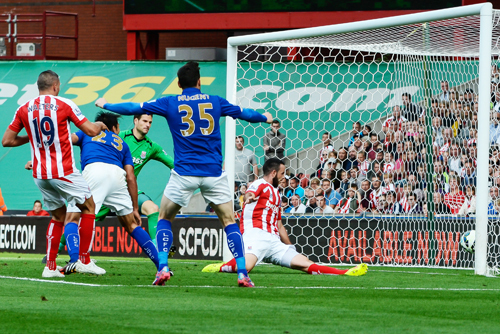 Walters was next to threaten for the Potters, but didn’t connect with his shot allowing Hamer a comfortable save. In a rare chance for City King sent a long-range effort narrowly wide, but Stoke were soon threatening again and Crouch sent an acrobatic volley just over the right hand angle. Further chances for Shawcross and N’Zonzi were thwarted and City were probably more relieved to hear the half time whistle than their hosts. Nigel Pearson had a reshuffle at the break and Drinkwater and Cambiasso emerged from the tunnel for the second half, replacing Mahrez and King. Although Moses wasted a good early chance for Stoke, blazing over when well-placed, it was a much improved Leicester performance, with Cambiasso the architect of some great moves. And it was the visitors who delighted their followers with a 65th minute opener. Ulloa retained the ball in a crowded situation and fed it to Konchesky down the left, his low cross reached Ulloa at the far post, and he somehow reached back to the ball a yard behind him and clipped it into the net. City had 25 minutes to hold on to a precious lead, and that is what they did. De Laet blocked a N’Zonzi’s shot, before Hammond almost made it 2-0 with a low 20 yarder that went two inches wide of the left hand upright. 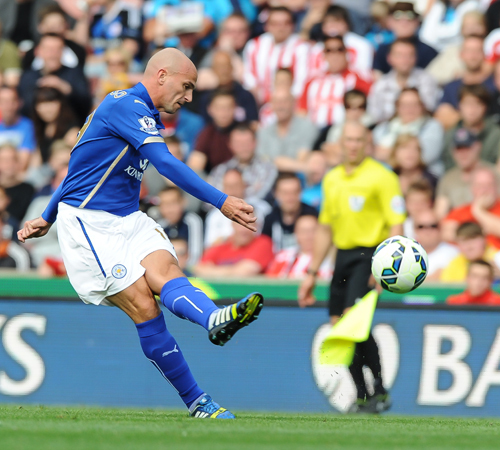 Hammond then couldn’t quite direct his header from a beautifully delivered Cambiasso free-kick. A great run from Moore, ended with Ulloa sending De Laet in on goal but he couldn’t keep his shot down. As Stoke grew more desperate the pressure ramped up and Hamer twice preserved City’s lead – parrying a fierce Diouf shot and then blocking a point blank effort from the same player during a late scramble. City were not to be denied their first Premier League win since May 2004 however, and this well-fought victory saw them reach the top half of the table. Stoke: Begovic, Bardsley, Pieters (Muniesa 84), Shawcross, Wilson, Whelan, N’Zonzi, Moses, Bojan (Diouf 74), Walters (Assaidi 82), Crouch. Subs: Sorensen, Huth, Arnautovic, Adam. Leicester: Hamer, De Laet, Morgan, Moore, Konchesky, Mahrez (Drinkwater 46), Hammond, King (Cambiasso 46), Schlupp (Vardy 76), Ulloa, Nugent. Subs: Smith, Wasilewski, Knockaert, Wood.Referee: Michael Oliver. Attendance: 27,500. 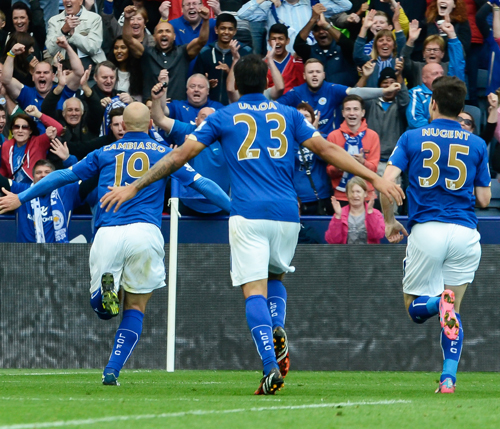 Nigel Pearson made no changes to the side that started at Chelsea last week, with new signing Cambiasso on the bench. City enjoyed a decent start to the game with probing runs from Mahrez and De Laet, before a lengthy stoppage for treatment after Schlupp and Koscielny had a serious coming together of heads. Although the French Arsenal defender was patched up and brought back into the action he only lasted until the 26th minute. Mahrez then raced forward again, exchanging passes with Nugent before sending a shot just wide of the post. However, it was the visitors who took a 20th minute lead when Cazorla’s neat ball over City’s defence was squared by Sanogo for the well placed Sanchez to find the net. As in the previous home game City did not allow their heads to go down and they were on level terms three minutes later. 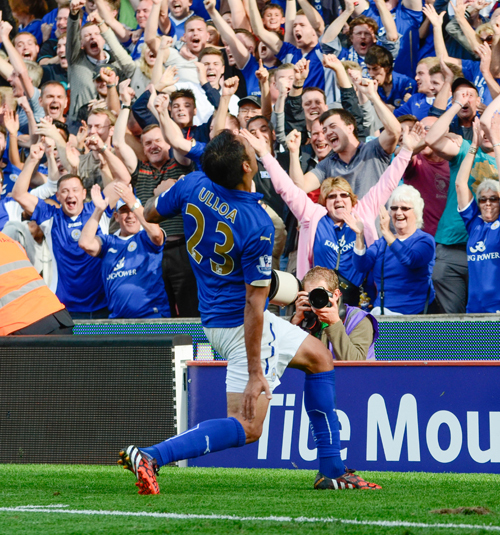 A fantastic cross from Schlupp on the left fell perfectly for Ulloa to nod in at the far post and raise the KPS roof. A couple of chances by Sanogo were blocked as Arsenal had a spell of pressure, but City also had their chances towards the break. and then a run and shot from Mahrez was saved by Szczesny. Neither side made a change at the break, and Cazorla had the first chance but sent it wide. Ulloa then carved out a fantastic opportunity for himself but hit the side netting with only Szczesny to beat from close in. As the game opened up play flowed from one end to the other and Schmeichel made saves from Ramsey and Monreal; while Nugent was denied by a Debuchy challenge when well-placed for an attempt on goal. Moore, then blocked a Cazorla effort with the deflected ball sailing harmlessly over the bar. 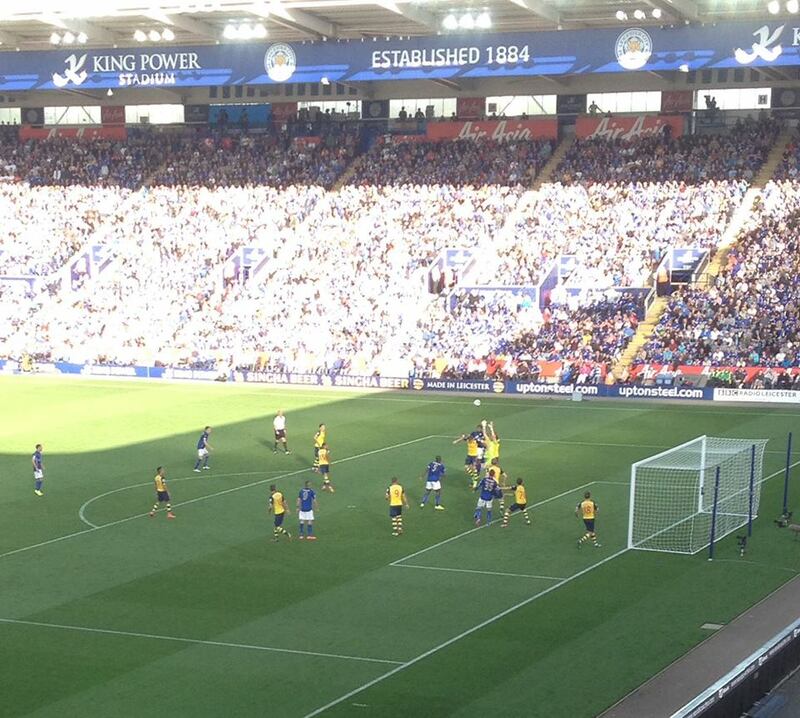 Vardy came on for Schlupp (who had a fantastic first half) and soon carved out a chance for himself with a determined run, playing a ball off Nugent before forcing a good save from Szczesny as the crowd roared him on. City survived a bit of late Arsenal pressure before Drinkwater, on for Ulloa, sent a shot narrowly wide. The final whistle heralded another point for City, who could be very satisfied with the way they have handled the first set of fixtures before the international break. Leicester: Schmeichel, De Laet, Morgan, Moore, Konchesky, Mahrez (Albrighton 64), Hammond, King, Schlupp (Vardy 70), Nugent, Ulloa (Drinkwater 76). Subs: Hamer, Wasilewski, Cambiasso, Wood. Arsenal: Szczesny, Debuchy, Mertesacker, Koscielny (Chambers 26), Monreal, Őzil, Ramsey, Sanchez, Cazorla (Oxlade-Chamberlain 77), Flamini, Sanogo (Podolski 77). Subs: Martinez, Rosicky, Wilshere, Campbell. The FOX presents this fantastic set of 20 LCFC Champions cards for just £6.95 inc p&p …. click HERE to buy via Paypal.